A Concord-based startup recently launched its voice-activated fitness platform, designed to help users better understand data gathered on their health and physical activity. Cyborg Labs offers a free mobile app for Apple and Android products that logs users’ jogs, walks and hikes so they can track their daily activity. For a fee, users can upgrade their app to GO PLUS to include Cy, a virtual activity assistant that can be summoned by your voice to answer an assortment of questions about movement and biometric data. “I was an overweight teenager and I’ve struggled with weight most of my life, fluctuating up and down. The times I’ve been most fit are the times I’m most consistent with my activity,” said Founder and CEO Tim Near. While Near said some people may consider diets and exercise to be fads, consistent reminders from a mobile app can help consumers adapt their lifestyle. “If you can only do a 10 minute walk, it’s better than no 10 minute walk. It’s to bring activity to the forefront of their mind and become a component of their life,” said Near. The basic version allows users to engage in a friendly competition with other users. 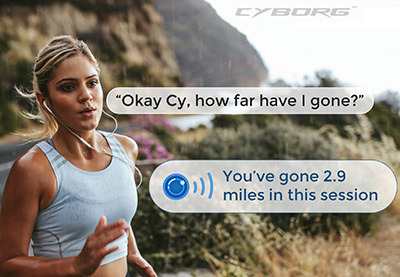 The upgraded version enables users to take advantage of additional capabilities, like asking Cy their pace mid-jog. “We’re going to be looking at whole day activity recaps, similar to Apple activity rings [on the Apple Watch]. We have a few ways, socially, we plan on making improvements on Apple activity tracking so it can be used more than a single session,” to let you know how active you’ve been, said Near. Earlier this year, Cyborg was one of twelve startups in Alpha Loft’s largest cohort yet for its program Accelerate NH. Near said meeting with Alpha Loft’s Josh Cyr, director of education and acceleration, and Kristin Crawford, director of development and entrepreneurship network, made him realize that he did not need to stop working on wearables, but did need to focus on the technology in the first step to bringing his product to market. “Josh said it’s better to do one simple thing well than all of these functionalities that are half baked,” said Near. Cyborg is starting to raise funds in its seed round, with a goal of $1 million. Previously, the company raised $120,000 from friends and family. Near said Accelerate NH held a session on fundraising, but Near thinks more has to be done to court venture capital firms.